The Maldives; sun, sandy beaches, vacations, picturesque, and now also death/thrash metal! 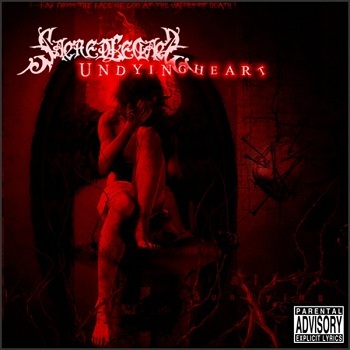 SACRED HEART has been an ongoing concern since 2006, with Ahmed Shahyd as the guitarist and founder. Inspiration comes from thrash, but also from melodic and progressive metal, plus Japanese Anime soundtracks! This is the band´s second album, originally released in 2008, but the third album, plus Shahyn´s second solo album, are already in the works for 2011. Are there recipient fans for this massive output? I wonder actually. This is an album of contradictions. On one hand there is the beautiful guitar orientated instrumental tracks, such as “Infinity Reloaded” and the title track. There is also the vocal version of the title track, a slow but moving piece with guests Shaani and Fal. But you better brace yourself when vocalist Ali Ashraf grabs the mike. The closest thing might be Scots CELEBRAL BORE, but they aren´t in the business of beautiful instrumental music…at all. Ali growls in a machine like way, just about the worst vocals since someone recorded the sounds of a screwdriver hitting the food mixer at full throttle. This may well work in the Far East, where extremes are generally well-received. But in Europe it´s a different bag all together… This is not my bag anyway, but it would have been had they stuck to the stunning instrumental stuff.